Meadow Lodge Home Care Services provides a full spectrum of care, including practical care, personal care and complex care. We work with the Elderly, those with Learning Disabilities, Physical Disabilities and Mental Health Illness. We provide help, assistance and support for everyday tasks and can assist with activities such as light domestic duties, shopping or cleaning. We are also there to provide friendship, reassurance and companionship and when needed, more intensive support after a hospital discharge or recovery from an illness. We can provide more intimate care if required for all age groups. Helping with the demands of a daily routine can greatly enhance a person's quality of life. We support those needing help with personal care such as getting in and out of bed, bathing and other intimate tasks. There are times when the care required becomes more complex and challenging. Be it a discharge from hospital, palliative care or those with long-term multiple and intensive needs. We can work closely with other agencies, families and individuals to provide the highest quality care and support. 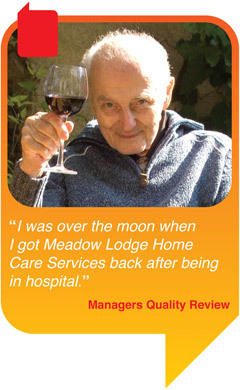 Meadow Lodge Home Care Services offers a broad range of affordable care and support solutions, tailored to an individuals personal requirements. To discuss this and the fees involved please feel free to contact us. Our services are available on a short or long term basis. Our comprehensive quality assurance process and complaints procedure gives you clear guidelines to follow if you are unhappy with the service you are receiving. We alter our care plans on a regular basis to meet the changing needs of our customer.